Each Kill Team: Commander kit comes with a multi part plastic miniature as well as the tokens, data cards and rules necessary to field your chosen Commander in a game of Warhammer 40,00: Kill Team. 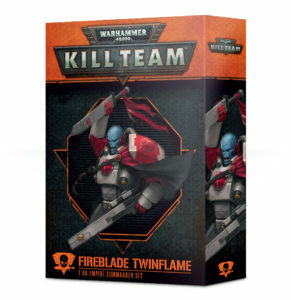 - A Cadre Fireblade: this multipart plastic kit is used to represent Shas’nel Twinflame – or the Commander of any T’au Empire Kill Team you wish. His armour is elaborate, with T’au symbols adorning the various panels, and he holds aloft a large bonding knife, a long-barrelled pulse rifle with marker light at his hip.